Now who do you think committed the most heinous crime seen within this 84 minute movie made in 1976? Could it have been it's Director: Tso Nam Lee? Or then again, maybe it was one of his Actors: Bruce Li, Yi Chang, or Kang Chin? If you want to find out more, plus what this crime actually entails, you know what you have to do. Hai-Ya!!! You're having me on, George! Please don't tell me this is true! Please don't tell me that Bruce Lee has pegged it! Especially not in an apartment belonging to that floozie called Susie! F*cking hell! That's a right bugger, isn't it? I tell you what I'll do though. I pop round their and see how this happened myself. And I promise you, mate, I'll do my damnedest to investigate how Bruce kicked the bucket as soon as possible. Huh? What's that you say, George? Before I go, you want to tell me that Susie has some very dubious friends in the criminal underworld! And that after Bruce died, she was admitted into hospital because she was stuck down with clinical depression! OK. Thanks for that additional piece of information, buddy. With that in mind, I'm sure that'll help me when I snoop around Susie's home, hospital bed, plus that seedy strip-club located nearby, owned by that hood named Fung. Furthermore, with me being such an amazing martial artist -- who goes by the name of David (Bruce Li) -- I bet my bottom dollar I can kick the living Wok out of anyone who tries to bar my path. Still. That's most probably why what next transpires hits the skids, when my girlfriend Tei suddenly pays me a unsuspected visit. As George gets whacked - Susie isn't stacked - a kidnapping takes place - and at the end of the day, this film is a bloody disgrace. Now to be blatantly honest with you, dear reader, it would be very easy for me to bash the living granny out of, 'Exit The Dragon, Enter The Tiger'. 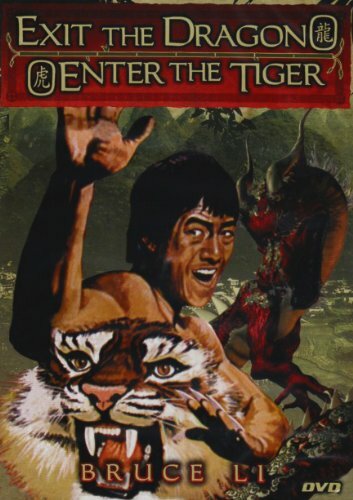 Mainly because it's another one of those Kung Fu flicks that's cursed with dodgy dubbing, dodgier camera-work, plus an even dodgier story-line, that's as direction-less as head-less chicken without any body or feet. But no. You don't want me to go down that road, do you? No. Of course you don't. You want me to convey my feeling about this picture in a much more orderly fashion. So first off, I best mention their's a smidgen of truth hidden within this flick. Bruce Lee did die whilst he was visiting the house of a movie starlet named Mai Pang. Moreover, at the time of his demise, there was also a rumor circulating that implied some noted underworld figures were connected with his passing. Admittedly, I'm not trying to imply this film is totally accurate with it's account. Far from it. Although the straight forward story-line it ultimately presents isn't that bad to follow. Plus I did enjoy the detective-like stance the main hero took to tackle this adventure. Oh! And while I'm on the subject of the hero -- Bruce Li -- as most of you may know, I am a very big fans of his. Since I first saw this wannabe Lee on the small screen many-many years ago, I knew deep down inside me that he was a genuinely good actor, and that he could have had a much better career if he was treated properly. Take this flick for instance. In it Bruce does a fairly good job of portraying a disciple of Lee. Not only by emulating his fighting style during some of those surprisingly good fight scenes -- only some mind you. But in addition to this, I did get a kick out of those few occasions where Li’s character disguised himself in the same way Bruce did in ‘Fist of Fury’ -- as is a nice nod and a wink to what has come before. On the flip side of my praise, though, I'm afraid to say this movie tries too hard to explain away the why, the how, the where, and the when, of Bruce’s death, and in a rather convoluted and exploitative fashion. Heck, just in the same exploitative way 'Game of Death' showed archive footage of Bruce’s funeral, this film does likewise, whilst simultaneously trying to pick up an extra buck or two by associating its pretext to Bruce’s death. Now I could go on with this line of thought, folks, yet I won't. Oh no. Because this is a pretty good time for some filmic-facts. (1) 'Seven Seas Motion Pictures Company' first released this production in America, on the very same month the first commercial Concorde flight took to the skies -- January, 1976. 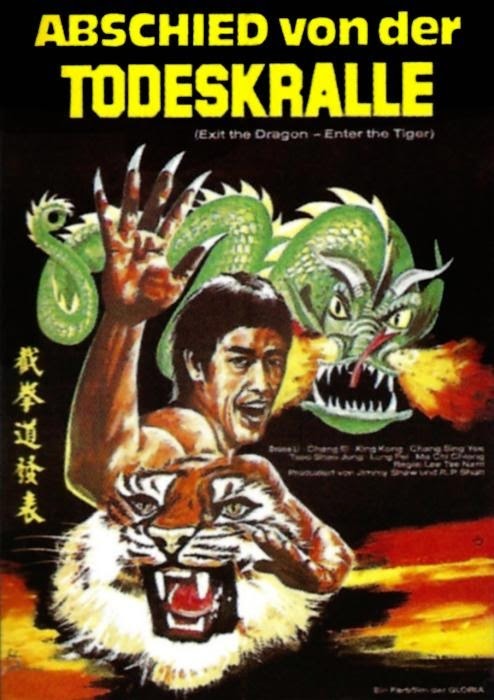 (2) Loosely translated, this project was entitled 'Out The Dragon, Comes The Tiger' in Spain; 'Hi Bruce Lee, Hello Tiger' in France, and originally throughout Asian provinces it was called either 'Superstar' or 'Bruce Lee: The Stars Of Stars'. (3) I'm sure you noticed that some of the melodies heard within this adventure came from other more noteworthy productions. For instance, there John Barry's 1974 film-score for 'The Man with the Golden Gun'; Pink Floyd's 'Shine On You Crazy Diamond'; plus Isaac Hayes' 'Three Tough Guys'. (4) Even though this film is supposed to be set in Hong Kong, you can tell that it isn't, mainly because the cars in it are driving on the right hand side, when they are supposed to be driving on the left. Ops! Plot glitch! (5) There were two tagline used to promote this picture. The first one was 'NOW...it can be told! The hidden story revealed!'. Whilst the second one was 'SEE.. Bruce Lee choose his successor!'. (6) The director of this film, Tso Nam Lee, has been in the industry for thirty-three years, and in total, he has directed thirty-five full feature length films. 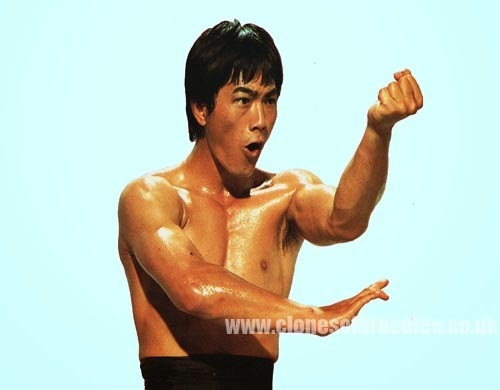 (7) Not only was Hsin Yi Chang the writer of this flick, but he was also the writer of such flicks as 'Snake and Crane Arts of Shaolin', 'Shaolin vs. Lama', and 'Black Belt Jones 2'. (8) After this movie scratched it own eyes out, Bruce Li starred in 'The Dragon Dies Hard'; whilst Yi Chang and Kang Chin both starred in 'The Blazing Temple'. All in all this is an OK-ish film, with some nice bits in it, but more to do with cash than honor.